1. Saudi - Chinese relations started in 1990. Despite the short period of relations that does not exceed 28 years, the Saudi - Chinese relations have seen a great and accelerating development towards further cooperation and mutual understanding at all levels. Mr. Ambassador, how would you describe these relations?, and what are the most important stages of the Saudi – Chinese relations?, and what do you think is the reason behind this convergence between the two sides? Since the establishment of diplomatic relations in 1990, the relations between China and Saudi Arabia have seen sustained and rapid development. The bilateral relations have been elevated to the comprehensive strategic partnership. With the political mutual trust between the two sides increasingly strengthened, the two sides supported each other on issues involving each side’s core interests and major concerns. The deepening of practical cooperation has led the bilateral cooperation to the forefront of China’s cooperation with other Middle Eastern countries in many areas. At present, in the face of profound changes in the world's political and economic structure, the strategic and comprehensive nature of the relations between China and Saudi Arabia has become more prominent. Both sides support the establishment of a new type of international relations centering on win-win cooperation and both adhere to the principle of non-interference in internal affairs. Both sides call for guiding economic globalization to develop towards a more inclusive, mutually beneficial and fair direction, advocate that a country's transformation and upgrading could be accelerated through the development of connectivity and international capacity cooperation, and commit to resolving global and regional hot issues through negotiation and dialogue. The development of the relations between China and Saudi Arabia is inseparable from the support and guidance of the leaders of the two states. In January 2016, President Xi Jinping visited Saudi Arabia and the two countries established a comprehensive strategic partnership and decided to establish a High-level Joint Committee of China and Saudi Arabia to push bilateral relations into a new stage of rapid development. In August, then Crown Prince Mohammad visited China and held the first meeting of China-Saudi Arabia "High-level Committee" and attended the G20 Hangzhou Summit. In March 2017, King Salman visited China, which further promoted the alignment of development strategies of the two countries and deepened the practical cooperation under the “Belt and Road” framework. In August, Vice Premier Zhang Gaoli of China visited Saudi Arabia and held the second meeting of “High-level Committee” with Crown Prince Mohammed, which have brought the practical cooperation in various fields to a new level. The leaders of the two states have established close working relationships and profound personal friendship. With the top leaders’ concerns and promotion as well as the joint efforts of various departments of both states, the bilateral relations have continuously moving forward. 2. Let’s have a little talk about the recent visits of the Chinese president to Saudi Arabia in January 2016, and the Saudi king to the People’s Republic of China in March 2017. There was a warm welcome on both sides. The Chinese president’s visit saw the transformation of the relations from strategic cooperation to comprehensive strategic partnership. The Saudi king’s visit saw the activation of this partnership through signing cooperation agreements worth $65 billion between the two states. Mr. Ambassador, how do you see these visits and their reflections on the relations between the two sides? In January 2016, President Xi Jinping made a historic visit to Saudi Arabia, which was the first stop of his visit that year and also the first Middle East country President Xi visited after he was elected the president. During the visit, the two heads of state announced the establishment of a comprehensive strategic partnership and decided to establish a High-level Committee between China and Saudi Arabia, which charted the course for the bilateral relations in the future and led bilateral practical cooperation to a higher level. In March 2017, King Salman paid a state visit to China, which was his visit again after 11 years since his last visit to China as well as his third visit to China. His visit was of great significance to enhance friendship between the leaders of the two countries, consolidate strategic trust between China and Saudi Arabia and promote practical cooperation in various fields. During this visit, the leaders of the two countries witnessed the signing of a series of cooperation documents in many fields, including capacity, trade, space, new energy and education, and the two sides also jointly organized a series of cultural and economic activities. 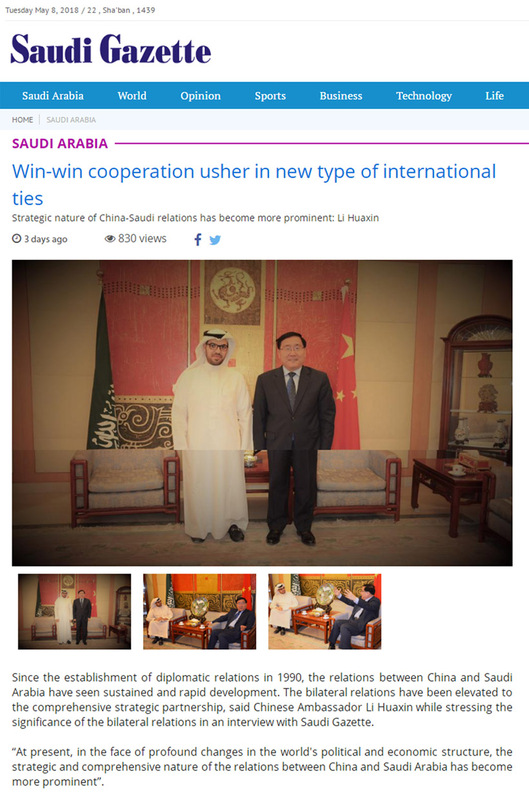 The new round of interaction between the highest leaders of the two countries opened a new era of comprehensive and rapid development of China-Saudi Arabia relations, and also sent a positive signal to the international community that the two sides would strengthen strategic cooperation, deepen the alignment of development, promote regional peace and build a community with a shared future for mankind. 3. Trade is the most important aspect of our relations; would you tell us about the volume of the Chinese – Saudi trade cooperation in numbers? Since 2013, China has been the largest trading partner for Saudi Arabia, and Saudi Arabia has been China's largest trading partner in Western Asia and Africa. From 2000 to 2015, Saudi Arabia was the largest crude oil supplier for China in 16 consecutive years. In 2017, the total amount of trade between China and Saudi Arabia reached $49.984 million, with a year-on-year increase of 18. 22%, of which China exported $18.22 billion to Saudi Arabia and imported $31.7 billion. In 2017, China imported 5,218.12 tons of crude oil from Saudi Arabia, up by 2.31% compared to the previous year, accounting for 12.44% of China's total crude oil imports, with a value of $205.11 billion, a year-on-year growth of 31.74%. In 2017, China invested $88.79 million in Saudi Arabia and Saudi Arabia invested $150 million in China. 4. In light of the current economic trend, the People’s Republic of China is keen to implement the ‘Belt & Road Initiative’, while Saudi Arabia is eager to implement the Saudi ‘Vision 2030’. In general, how does the People’s Republic of China perceive the Saudi ‘Vision 2030’? Is there a possibility of harmony and integration between the two visions with respect to increasing cooperation in energy, finance, production capacity, and infrastructure? ‘Vision 2030’ is the guiding principle for Saudi Arabia to push forward the economic transition and comprehensive development，which focuses on the non-oil economy to improve the vitality of economic development. Since the inauguration of Saudi ‘Vision 2030’, Saudi Arabia has made new achievements in reform and development across many fields, which China appreciates. China is willing to support Saudi Arabia to realize ‘Vision 2030’ and to be the worldwide cooperation partner for the diversification of Saudi Arabia’s economy. China also appreciates Saudi Arabia’s active participation in the construction of the ‘Belt & Road Initiative’, and welcomes Saudi Arabia to be the worldwide cooperation partner in the co-construction of the ‘Belt & Road Initiative’. During President Xi Jinping’s visit to Saudi Arabia in January 2016, the two countries signed the cooperation agreement to construct the ‘Belt & Road Initiative’ together. Both sides are making decision to sign an implementation plan to integrate ‘Vision 2030’ and the ‘Belt & Road Initiative’ and both sides agreed to build a series of package deal cooperation mechanisms in the energy field. At present, Saudi Arabia has been striving to develop its industry and push forward the industry development in nuclear energy, renewable energy, science and technologies and investment to build Saudi Arabia into a regional trade and logistics center. China is competitive and experienced in many fields in which Saudi Arabia is interested. Both sides have complementary advantages and huge potential in cooperation. It is believed that the cooperation between China and Saudi Arabia will stride to a new stage with more vitality，more sustainability and more results. The achievements of integrating the ‘Belt & Road Initiative’ and ‘Vision 2030’ will benefit both countries and lead the regional cooperation. 5. On 30th August 2016, Chinese–Saudi high-level joint committee was founded and headed by the Saudi Crown Prince Mohammad Bin Salman, and by Chinese Vice Premier Zhang Gaoli. The committee held its first meeting in China where 17 agreements and memorandums of understanding were signed in economic, trade, and development programs. How would you evaluate this committee?, and do you think this committee will push the comprehensive strategic partnership forwards? In January 2016 the two heads of state decided to establish China–Saudi Arabia High-Level Joint Committee. Since then the Committee has held two meetings respectively in Beijing, China and Jeddah, Saudi Arabia. The mission of the Committee is to implement the important consensus reached by the two heads of state, to coordinate and promote cooperation in various fields for both sides. In August 2016，the first meeting of the Committee was held in Beijing, during which Zhang Gaoli and Mohammad Bin Salman signed an Agreement on Forming Chinese–Saudi High-Level Joint Committee between the Government of the People’s Republic of China and the Government of Saudi Arabia and a Minutes of Chinese–Saudi High-Level Joint Committee's First Session between the Government of the People’s Republic of China and the Government of Saudi Arabia, and witnessed the signing of bilateral cooperation documents in politics, energy, finance, investment, real estate, water resource, quality testing, science and technologies and cultural exchanges. In August 2017, the second meeting of the Committee was held in Jeddah. Both parties agreed that the first Committee has achieved remarkable results, in which the key projects were advanced smoothly. The two sides signed a list of key projects for production capacity and investment cooperation, of which 30 projects were identified. The bilateral trade has developed well and the people-to-people and cultural exchanges have been deeply rooted in people’s hearts. Related cooperation has been deeply favoured by the people of both countries. The two sides have signed the minutes of the meeting and witnessed the signing of cooperation documents in the fields of investment, trade, energy, postal services, communications and media. In the next stage, the Committee will commit to strengthening the alignment of development strategies of the two countries, promoting practical cooperation, intensifying people-to-people and cultural exchanges, advancing mutual benefit and win-win results, and building a new pattern of all-dimensional cooperation in China and Saudi Arabia, so as to continuously enrich the connotation of the comprehensive strategic partnership between China and Saudi Arabia. 6. Cultural exchange between the two states is inevitable at many fronts, how is it possible to deepen it? In recent years, there have been many new highlights in China-Saudi Arabia cultural cooperation. In 2013, China participated in Saudi Arabia’s Jenadriyah Heritage and Cultural Festival for the first time as a guest country. More than 30 Chinese traditional arts and more than 600 exquisite works of art caused great repercussions among Saudi citizens. In February 2017, the premiere of the first animation jointly produced by China and Saudi Arabia, Kong Xiaoxi and Hakim was held in Saudi Arabia and enjoyed by the audience of the two states. In December 2016, Saudi Arabia held the exhibition --Roads of Arabia: Archaeological Treasures of Saudi Arabia in China for the first time. During the visit to China in March 2017, King Salman attended the closing ceremony of the exhibition with President Xi. The King also attended the opening ceremony of the King Abdulaziz Public Library PKU Branch and accepted the award of Honorary Doctorate from Peking University. At the end of last year, China again held the "Chinese Culture Week" in Riyadh and Jeddah after seven years, and it was warmly welcomed by the Saudi public. In April, China will also host the “Happy Spring Festival” dragon and lion art performance in Saudi Arabia. With the gradual implementation of the Saudi “Vision 2030”, the two countries will have more opportunities to cooperate in the cultural field, especially in new areas such as film, theater and entertainment. To strengthen people-to-people bonds is an important part of China’s “Belt and Road” initiative and is also an important task of the two countries’ High-level Committee. The two sides will commit to strengthening exchanges and cooperation in such fields as culture, education, health, science and technology, tourism, and news. 7. The “Two Sessions” held recently in China have aroused the attention of the world. What new figures and highlights in respect of China’s economy are included in Premier Li Keqiang’s Report on the Work of the Government? The past few years have witnessed anemic world economic recovery, volatility in global financial markets, and a sharp rise in protectionism. In China, structural issues and underlying problems have become more acute, downward pressure on the economy has continued to mount. In confronting this new environment, with a commitment to the general principle of pursuing process while ensuring stability, the Chinese government has focused on developing new and better approaches to macro regulation, kept major indicators within an appropriate range, and achieved stable, positive economic performance. Over the past five years, China’s economic strength has reached a new high. China’s gross domestic product (GDP) has risen from 54 trillion to 82.7 trillion yuan (approximately 13.16 trillion US dollars), registering average annual growth of 7.1 percent; and its share in the global economy has grown to roughly 15 percent up from 11.4 percent. China’s contribution to global growth has exceeded 30 percent. More than 66 million new urban jobs have been added. The structure of the Chinese economy has seen a major transformation. With the share of the service sector rising from 45.3 to 51.6 percent of the economy, consumption’s contribution to growth has increased from 54.9 to 58.8 percent, becoming the main driver of growth. High-tech manufacturing has achieved an average annual increase of 11.7 percent. Innovation-driven development has yielded fruitful outcomes. China’s investment in research and development has grown at an average annual rate of 11 percent, ranking the second in the world. The contribution of technological advances to economic growth has risen from 52.2 to 57.5 percent. In manned spaceflight, deep-water exploration, quantum communications, large aircraft development, and more, China has seen a stream of major outcomes of innovation. In high-speed rail, e-commerce, mobile payments, and the sharing economy, China is leading the world. Business startups and innovation are thriving all over the country, and the average number of new businesses opened daily has risen from over 5,000 to more than 16,000. Living standards have been constantly improving. A number of 68 million of poverty population has been decreased and the poverty incidence dropped from 10.2% to 3.1%. The resident income has been increased by 7.4% on annual average, outpacing economic growth and creating the world’s largest middle-income group. Tourist departures have grown from 83 million to over 130 million. The environment has seen gradual improvement. Both energy and water consumption per unit of GDP have fallen more than 20 percent and the number of days of heavy air pollution in key cities has fallen 50 percent. Forest coverage has increased by 163 million acres (10.87 million hectares), and the area of desertified land has been reduced by close to 2,000 square kilometers on average each year. Encouraging progress has been made in green development. In the year just passed, all main targets and tasks for economic and social development were accomplished and performance has exceeded expectations. GDP grew 6.9 percent and personal income rose 7.3 percent, both beating the previous year’s growth rates. Around 13.51 million new urban jobs were created, and the jobless rate was the lowest in recent years. Industrial growth began to rebound, and corporate profits increased 21 percent. Government revenue grew 7.4 percent, reversing the slowdown in growth. The total import and export value rose 14.2 percent. Inward foreign investment reached 136.3 billion U.S. dollars, hitting a new all-time high. The state of play in the economy was good, with growth and quality, structural improvement, and performance each reinforcing the other. What about the political sphere of the Chinese – Saudi relations in light of the recent developments in the region? In your opinion, where do Riyadh and Beijing share the same political stand with respect to the regional crises? As a major country among Arabic and Islamic states as well as a great energy country in the world, Saudi Arabia plays a very important role in the Middle East affairs, making positive contributions to maintaining and promoting the regional peace, stability and development. As a permanent member of the UN Security Council, China has always attached importance to maintaining the peace and stability in the Middle East and committed to boosting the development and cooperation with regional countries. In January 2016, President Xi Jinping put forward on his visit to the Middle East that China devotes to be the builder of peace, impeller of development, booster of industrialization, supporter of stabilization and sincerest partner of the Middle East. Both China and Saudi Arabia are committed to solving global and regional hot issues through negotiation and dialogues. China believes that the Middle East affairs, over which the regional countries have the best say, should be resolved by considering specific factors such as history, culture and religion in the certain region, and seeking comprehensive, just and enduring solutions through political means, dialogues and consultations. China stands ready to work together with regional countries including Saudi Arabia to make unremitting efforts for enduring peace and stability in the Middle East. Terrorism has become a global threat that requires international cooperation to combat; what is the level of coordination and mutual cooperation between Riyadh and Beijing in combating terrorism, with view of the Saudi expertise in this area? Both China and Saudi Arabia were suffered from terrorism and made great sacrifices in the fight against terrorism. Both sides propose that the international community should gather synergy and abandon double standard in counter-terrorism, and in particular, terrorism can not be linked with specific countries, nations and religions. Faced with the threat of terrorism, all the countries are a common destiny sharing common joys and sorrows. The international community should build a concept of a community of shared future, closely follow new trends and characteristics in the evolution of such threats, enhance cooperation and jointly respond to terrorist threats. For many years, the sound anti-terrorism cooperation has been established between China and Saudi Arabia. Under the new situation, both countries are determined to further strengthen this cooperation in order to create a sound environment for tranquility and development of the two countries and the region at large. In pursuit to play a more active role in the Middle East, the People’s Republic of China appointed its first special envoy for the Syrian crisis in March 2016. What is the general view of the People’s Republic of China regarding the resolution in Syria? China has always held that the Syrian issue could not be resolved by military means, and it could only be resolved by political solutions. The top priority is that all parties in Syria should restart dialogue and negotiation as soon as possible with the support of the international community and under the mediation of the United Nations, and find a solution acceptable to all through a Syrian-led and Syrian-owned political process. Only in this way can the humanitarian situation in Syria be essentially alleviated and the Syrian people get rid of sufferings at an early date. At the same time, the international community should strengthen anti-terrorism cooperation and resolutely fight against all the terrorism organizations listed by the UN Security Council. China has always supported the relief of the humanitarian situation in Syria and supported a political solution to the Syrian issue. The Chinese government’s special envoy on Syrian issue has actively participated in the peace talks in Geneva and made in-depth efforts to advance peace talks. China stands ready to continue playing a constructive role for an early, comprehensive, fair and appropriate solution to the Syrian issue. How does the People’s Republic of China view the current situation in Yemen? At present, the situation in Yemen remains complex, with peace talks stalled, conflicts continuing, and the humanitarian situation becoming severe. China is concerned about this and shares the same feelings with the Yemeni people. On the evening of March 25, Yemen's Houthi militia launched seven ballistic missiles at Riyadh and Jizan, causing 1 death and 2 injuries. China has consistently opposed and condemned acts of violence against civilians. It is hoped that all parties involved in the Yemeni issue will start political dialogue as soon as possible and reach an inclusive solution. China supports the new UN Special Envoy for Yemen and is ready to work with all parties to promote a political settlement of the Yemen issue. How do you assess the status quo in Libya? And how does the People’s Republic of China view the resolution of the crisis there? The Libyan Political Agreement reached in December 2015 serves as a major achievement for the Liberian people in their efforts to restore peace and stability. For more than two years, the Libyan people have made unremitting efforts to advance the implementation of the Agreement and have made some progress. At the same time, Libya still faces multiple challenges such as large political differences, a fragile security situation, rampant terrorist forces, and prominent refugee immigration issues. China attaches great importance to the development of the Libyan situation and supports any effort to stabilize the situation in Libya, promote the political solution to the Libya issue, and promote all parties concerned to work together to combat terrorism. All parties in Libya should take active and effective measures to advance the peace process. The international community needs to further build consensus and provide feasible and effective assistance for the peace process in Libya. 2018 marks the 30th anniversary of the Chinese – Palestinian diplomatic relations, how do you read the developments in this issue? During the recent visit of President Mahmoud Abbas to Beijing, the Chinese President presented a four-point proposal to the political settlement of the Palestinian issue; what does this proposal consist of?, and does the proposal go in line with the Arab peace initiative based on the two-state resolution, and the establishment of an independent and fully sovereign Palestinian state on the 1967 borders with East Jerusalem as its capital? China is one of the earliest countries that supports the just cause of the Palestinian people and recognizes the Palestine Liberation Organization and the State of Palestine. The peoples of the two countries understand and support each other. In recent years, China and Palestine have maintained close high-level exchanges, consolidated political mutual trust, and steadily developed cooperation in various fields. First, firmly advance the political settlement on the basis of the two-state solution. China firmly supports the two-state solution and the establishment of an independent State of Palestine, enjoying full sovereignty on the basis of the 1967 borders and with East Jerusalem as its capital, and will as always play a constructive role in resolving the Palestinian issue. Second, uphold a common, comprehensive, cooperative and sustainable security concept. China calls for earnest implementation of the UN Security Council Resolution 2334 and an immediate stop of all settlement activities in the occupied territories. China hopes that immediate measures will be taken to prevent violence against civilians. It is imperative to restart negotiations as soon as possible, speed up the political settlement of the Palestinian issue and achieve common and everlasting security fundamentally. Third, further coordinate efforts of the international community and strengthen the concerted efforts for peace. The international community should further coordinate with one another to put forward measures for peace with common participation at an early date. China is willing to participate in and support all efforts making for the political settlement of the Palestinian issue, and will hold a seminar for the peace lovers in Palestine and Israel within this year to contribute ideas and solutions to the Palestinian issue. Fourth, comprehensively implement measures and promote peace with development. While promoting political negotiation, it is also important to highly value the issue of development to advance Palestine-Israel cooperation. China regards both Palestine and Israel as important partners along the “Belt and Road”, and stands ready to carry out mutually beneficial cooperation in line with the idea of promoting peace with development to continue supporting Palestine in speeding up its development. China proposes to launch China-Palestine-Israel trilateral dialogue mechanism, and coordinate and push forward major projects aiding Palestine. The four-point proposal is China’s new endeavor to solve the Palestinian issue and also the general principle of China to promote the political solution of the Palestinian issue in next stage. China is willing to work with all parties to push forward Palestine and Israel for resolving current issues as soon as possible and restarting peaceful talk, in order to solve Palestine-Israel issue in a comprehensive, just and permanent manner, as well as realize peace and stability in the Middle East. The People’s Republic of China enjoys good relations with both Saudi Arabia and Iran. Taking into consideration that both countries are important sources of the Chinese imports of oil, and they are indispensable to the ‘Belt & Road Initiative’, can Beijing play a positive role in bringing the two different viewpoints of Saudi Arabia and Iran closer to each other? Both Saudi Arabia and Iran are friendly countries of China, and play important roles in regional affairs. China hopes that all countries in the region strengthen communication and cooperation. China opposes any action that interferes in the internal affairs of countries in the region. China hopes that all countries in the region uphold the principle of good-neighborliness and friendship, give priority to the regional peace and development, solve differences properly through dialogues and consultations, and construct mutual trust, in order to jointly build a Middle East with lasting peace, stability and prosperity. 15. What is your general view of the Chinese relations with the GCC?, and are there any impediments to the growth of these relations? The People’s Republic of China and the GCC started to hold negotiations on the free trade agreement in 2004, but they paused for five years, and then negotiation was resumed in 2016. After nine rounds of negotiations, how do you see the advancement of these negotiations?, How far are they proceeding now?, and what are the key issues keeping us back from the signing of a convention? In 2010, China and the GCC established a mechanism for strategic dialogue, three rounds of talks have been held in this framework so far. In 2014, a plan of action for bilateral cooperation from 2014 to 2017 was renewed. How do you assess the strategic dialogue path in achieving the objectives of cooperation in various fields including politics, trade, and energy etc. Will the plan be renewed? GCC is a significant regional organization in the Middle East and the Gulf region. It has already played and should continuously play an important role in regional and international affairs. Right at the foundation of the GCC, China established contacts with the GCC. Over the past 35 years, China’s relations with the GCC have developed constantly with the joint efforts of both sides. The GCC countries have been the largest crude oil supplier of China and rank the eighth among China’s trading partners for consecutive years. China is also a significant energy and trade partner of the GCC countries. The two sides set up mechanisms such as strategic dialogues, joint economic trade committees, and energy working groups and bilateral cooperation enjoys solid foundation and broad prospects of development. The negotiation on the China-GCC Free Trade Area has been making progress since it was resumed in 2016 while some disagreements remain. We believe that reaching free trade agreement conforms to the common interests of both sides and is helpful to promote further cooperation. These disagreements could be overcome as long as each side could uphold the spirit of win-win cooperation and mutual understanding and accommodation. The cooperation between China and the GCC boasts bright prospects with no obstacles. 16. What is the future of the Saudi – Chinese and the GCC – Chinese relations?, and how can they be promoted in order to achieve common interests and enhance regional and global security and stability? At present, the Saudi – Chinese and the GCC – Chinese relations are at a new historical starting point. China is making unremitting efforts to build a moderately prosperous society in all respects, and Saudi Arabia and other GCC countries are committing to promoting diversified economic development. China is willing to strengthen communication and coordination with the GCC and pool more converging interests to realize the strategic docking of respective development plans. Combining with the construction of the "Belt and Road", China carries out mutually beneficial cooperation with the GCC countries and elevates the level of bilateral relations. Recently, the relations among the GCC members are confronting with some difficulties. China sincerely hopes that the GCC countries could settle disagreements peacefully through political negotiation and return to the right track of jointly promoting peace and common development.